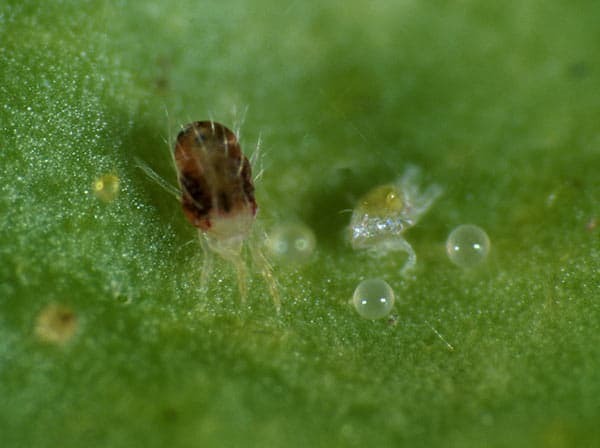 Spider mites are tiny arachnids (not insects) measuring about 0.5mm long with an oval shaped body which varies in colour from greenish-yellow, to virtually transparent, brown, and red-orange with two dark spots visible on either side of the abdomen. The life cycle involves five developmental stages: egg, larva, two nymphal stages, and adult. Immatures resemble adults (except they are much smaller and lighter in colour), and the newly hatched larvae have only six legs. Development in RSM is favoured by high temperatures and low humidities. The generation time is temperature-dependent lasting as long as 36 days at 15oC and as short as 6 days at 35oC. Dispersal is by crawling, air current or tools and clothing. Crawling is a common means of dispersal through the host plant; however, it can also be an effective means of interplant dispersal. Aerial dispersal begins with the mites aggregating on the uppermost portions of the plants, produce a thread of silk, which they use to balloon into the wind, sometimes carrying them great distances. Another method of dispersal, phoresy, is common when mites move by hitchhiking on other organisms and objects e.g. clothing and tools. Adults and juveniles feed on the underside of leaves by inserting their stylets into the plant cells and sucking out the cell contents resulting in typical ‘stippling’ damage i.e. white or chlorotic spots easily recognizable on the upper leaf surface. Defoliation, leaf burning, and even plant death can occur due to direct feeding damage. Indirect effects of feeding may include decrease in photosynthesis and transpiration. This combination of direct and indirect effects often reduces the aesthetic value and/or amount of harvestable material.